This year I am thankful for many things but since this is my blog about my writer's journey I thought I'd focus on that. Great links for writers will be involved so read on! #1) I am thankful for the use of my right hand. It seems like a simple thing until you lose it. Several years ago I broke it and my right wrist. The doctor said I would be lucky to get 60% use of it back. That was unacceptable to me. I finished six months of physical therapy in two and not only got full use of my hand back, but full strength as well. #2) I am thankful for my critique group the Scribe Sisters. A good critique group is like finding that pot of gold at the end of the rainbow. Such a thing is almost unobtainable it seems and yet is so worth the hunt when you do find it. If you're looking for your own you might try the wonderful writer's social network Scribblerati or Twitter. #3) I am thankful for each and every one of my followers here on Heather's Odyssey, Twitter, Scribblerati, and Goodreads. I've made the most amazing friends in the blogging community and other writers social media sites. Before delving into them I had never imagined such a tight knit, supportive group could exist. You all give me hope! #4) I am thankful to each and every agent and editor who has taken the time to read my query letter and submission materials. Without them searching for new talent we aspiring authors would be nowhere. If you're on the agent hunt yourself be sure to check AgentQuery. Remember to research each agent, read their blogs if they have them and check their websites. Have a very happy Thanksgiving everyone. 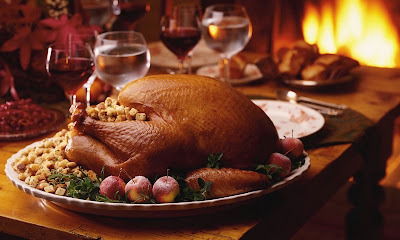 Tell me what you're thankful for then get back to your turkey basting, pie baking, wine tasting, or writing! Oh, hands! I am thankful for them, and all my functioning body parts. I'm glad you fought to get the use back 100%. And yeah, agents don't get thanked enough. I agree! Heather, This is beautiful. You know how thankful I am to you. You've been such a wonderful mentor is so many ways. From the bottom of my heart-- Thank you!!! Not only for what you do, but who you are. Happy Thanksgiving. You're welcome Shannon. I'm touched that you enjoy my Twitter Tuesday posts so much. Thank you for your kind words! Me too Lydia. If I hadn't fought so hard to recover I don't imagine I'd be writing much anymore. You're right, agents definitely don't get thanked enough! Thank you so much Karlene. It's hard to believe I have mentored you, you're so amazing and inspiring yourself! What a wonderful post, Heather. You are an incredibly generous and supportive person, and humble besides! Wow. I love all the advice in this post, especially that last part about turkey and pie and wine. It's good to remember what we are thankful for, and thank you for reminding me! I'm thankful for your post and your coming to make comments at mine! Aw, thank you Linda! LOL! Yes, the last bit of advice may be the best. Holiday wine is one of the things that makes this season great! Wow - I never thought about how lost I'd be without my hands! That's really something to be thankful for! I'm so glad you were able to get back to 100%, Heather! And I am grateful for your inspiring blog and story! Thanks for all your wisdom! It is isn't it Lorelei? It helps bring the holiday into perspective. Thank you so much for your sweet words! I love your blog! Thanks Elle! Happy list making and happy Thanksgiving! Heather, that's an amazing list! I'll add a non-writerly thing: first responders like my husband who work on Thanksgiving. A good group of people! Love you list, Heather. And have a great Thanksgiving! That's an excellent addition Julie! My good friend's husband is a fire fighter and I work in the law enforcement filed so the thought is greatly appreciated. Thank you Stina. I hope you have a great Thanksgiving too! Happy Thanksgiving. Your list sounds similar to mine. I'm thankful to be writing. Happy Thanksgiving to you too Gabi! The ability and talent to write is no small thing. I remember that every time I look at the scare on the back of my hand. Cheers to our writing! Those are all great things to be thankful for, especially that first one. I have a lot to be thankful for as well. On the writing front, I'm thankful that I will soon be a published author. I'm also thankful to have met so many other writing friends here online. I'm thankful you'll soon be a published author too Alissa! I can hardly wait to feature you on Heather's Odyssey as a debut author and read your novel. I'm so excited for you! Happy thanksgiving to you, too! I'm having a fantastic time reading thankful entries all over the blogosphere--everybody's stopping to smell the roses, and it's lovely! We all should be thankful not just this time of year but always. I'm thankful for this wonderful community of caring and supportive people. I am thankful for my health. Today among the thousands and I mean thousands of people I bumped everything with in Wizarding World, I saw a man in his thirties, legless in a wheelchair, bopping along toward the parking lot with a huge smile on his face. I dragged myself watching him, thinking my feet hurt and this happy soul didn't have any. Never take you mobility or health for granted. As you stated earlier about your right hand. We, as humans, do take so many things for granted. We just need to slow down and enjoy the little things in life. Family, friend, and spending time wit the ones we love. I couldn't agree more Amie, it is lovely! The times when we slow down and appreciate each other and all life offers are the best. Things like that always humble me too Michael and remind me not to take the things I have for granted. Thank you for sharing that story! Happy Thanksgiving to you and yours as well! I am so glad you got the full use of your right hand back. We take so many wonderful, everyday things for granted until suddenly they are no longer there. I'm always thankful whenever I see a comment on my blog from you -- and from all of my other blogging friends. Me? I'm working this Thanksgiving - people need rare blood every day and there are platelets to bacterial sample, blood to filter, and roads to run, bring rare blood to rural hospitals. Whew! Happy Holidays! Me too Roland, that is so very true. How sweet of you, thank you! I love seeing your comments here too! I'm so sorry you have to work today. I happened to get lucky, Thursday is my day off. Thank you Talli! It's so sweet of you to stop by on Thanksgiving! I'm so thankful to have the opportunity to learn each and every day through the people I meet online. I don't know how I would have gotten this far without you all. Aw, you're so sweet Angela! I feel the same way. The writing community is the foundation that holds me up! Thank you and I hope you had a wonderful Thanksgiving too. Heather, what a beautiful post! So glad you were able to recover the use of your hand, because I can't imagine the writing world without your contribution to it. That is so kind of you Jule, thank you so much!